I thank Bahá’u’lláh for having shown me the Light as early as 1962, during the Ten Year Crusade period. It has been a long journey in the Faith. My Bahá’í life has been full of tests, challenges and blessings. Today I am an old believer. Before my memory fails me totally, I wish to share some of the precious memories I could remember, with immense gratitude to the Blessed Beauty for having chosen this unworthy servant to serve Him during this King of Days! In the year 1958, I joined the Malayan Armed Forces. After 6 months of my recruit training, I was posted to Batu 5 Camp in Mentakab, Pahang to fight against the outlawed communist insurgents. In 1962 my regiment was selected to serve under the United Nation Organization (ONU) in Congo, East Africa. After completing my year of service in Congo, I returned to my original unit in Batu 5 Camp in Mentakab. While I was at the Batu 5 Camp, I met a new soldier by name of Arumugan who introduced himself as a Bahá’i. He started teaching the Bahá’í Faith to me each time we met. Arumugam too had just become a Bahá’í . 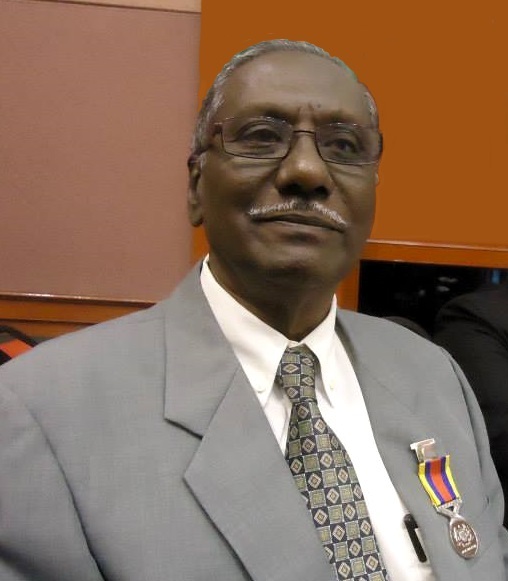 He is none other than the late Commando Arumugam. He not only gave me the Faith, but later also gave his son in wedding to my daughter on 5 September, 1993. We were first related as Baha’is, then through marriage. A few months later, he decided to join the Commando Unit and left for Port Dickson. A year later in mid 1964 my Regimen from Batu 5 Camp shifted to Sunggala Camp in Port Dickson. When my regiment moved to Sunggala Camp there were insufficient quarters for the married soldiers. Since I was already married on 5 January 1964, in Batu Gajah, Perak, I had to rent a house in Teluk Kemang. To my surprise, Mr. Arumugum was also renting a house close to my rented house. He took the opportunity to continuously teach the Faith to my wife and me. The teachings sounded fine to me, but I was not ready to accept the Faith. Born in a staunch Hindu family, I was hesitant. Later Arumugam introduced me to his Bahá’i friend, Mr. Satanam who was a kind, gentle and loving person. Satanam too slowly taught the Bahá’í to us. He visited us frequently for almost two months. We were very much touched by his loving ways of introducing the Faith. We saw Satanam was very sincere in the love he showed us. This time my heart slowly started to open up. One Saturday, Satanam brought some friends to my house. They were the late Mr. Rajaratnam, Mr. Ragavan and Mr. Muniandy. My wife and I were very happy to see some new friends visiting our home. 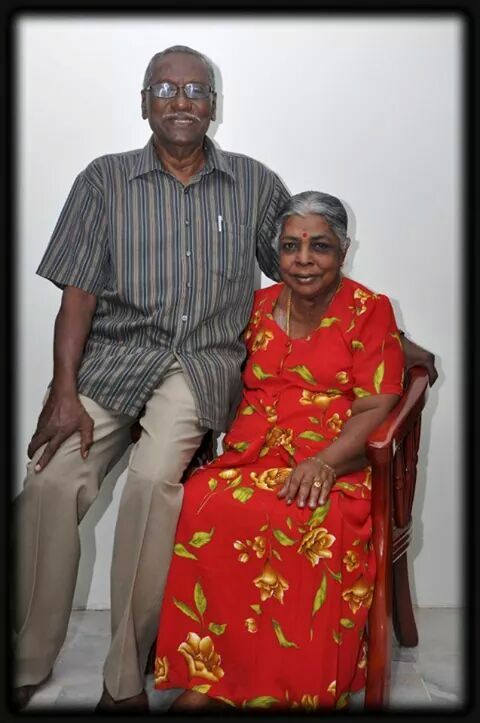 After a while when we were settle down, Mr. Rajaratnam said a prayer. Immediately after that Satanam started to ask my wife and me our opinion about the Bahá’í Faith. We both replied that we understood the basic teachings of the Faith. We added that the concept of progressive revelation was something different, which we had not heard before. Satanam must have guessed that we were ready to accept the Faith. Without wasting any time he gave us declaration cards and asked us to sign up. He further explained that the card was only for administration purpose. We accepted the faith on 4 Feb 1965. Just two days after our declaration fell the Nineteen Days feast of Mulk. The local friends encouraged us to host the Feast. My wife and I were happy to host the Feast. Satanam advised us that even water alone would be good enough to be served for the Feast. But my wife prepared a delicious meal for the Feast. That was a beginning that continues to this day. Before leaving Satanam gave us a prayer book, Hidden Words and the book called “Pattern of Bahá’í life” for us to read and understand the Faith even further. From that moment, my wife and I decided to take a serious step to observe the Bahá’i way of life and bring up our family to grow up in the path of service. Upon accepting the Faith, it was Satanam on whom I leaned to get a deeper understanding of the Faith. I asked him several questions and he gave me the best explanations. I simply loved his company. As a young growing Bahá’i at that period, I was in darkness. As a spiritual father for me, Satanam kept guiding me until I could stand on my own feet. Next were the books that I read that made me understand the Faith. Third was the moving talks at conferences by visiting Bahá’ís . It was in a convention organized by the National Spiritual Assembly of Malaysia in University Malaya in Kuala Lumpur in 1966 where I met many Baha’is for the first time. Whenever I was free I use to travel with Mr. Satanam in a 75 c.c. motorcycle to various places like Lukut, Pasir Panjang, Port Dickson town, Si-Rusa Inn, Teluk Kemang and close by estates for teaching. Many Bahá’i activities usually took place in Port Dickson. The most memorable were the Summer Schools and Conferences. At these conferences the foreign speakers, especially Hands of the Cause of God used to give inspiring talks. They moved the hearts of the friends to arise to serve the Faith. As a young and a new believer, I really enjoyed listening to the beautiful talks. These talks inspired me to share the message ofBahá’u’lláh to others fearlessly. Satanam never hesitated to take me along with him to conferences One of the first conferences that moved me deeply was the South East Asia \ Conference held in Singapore in 1969. I am thankful to a few other Bahá’í s who also deepened and inspired me. They are Uncle Yankee Leong, Mr. Nagaratnam and Mr. Ganasa Murthi. There were some distinguished Bahá’í visitors whose talks moved me very much. Topping the list were the Hands of the Cause of God. Dr. Muhajir’s several trips to Malaysia had a tremendous effect on me. From India came Mr. Afshin whose talks too moved me. 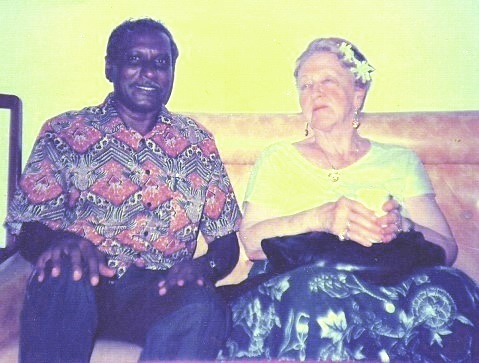 In 1989 Jack Davis came to conduct spiritualization courses in Malaysia. I was one of those fortunate to have participated in his course. Mr. Jack Davis conducted courses on the sufferings of Baha’u’llah. That kindled my heart and woke me to go as a traveling teacher to Cambodia and to Sri Lanka on two occasions. I also undertook a short teaching trip to Brunei. But it was to Kuantan in the state of Pahang that I was a home front pioneer for a longer period. I was posted to Kuantan Batu 10 camp on 15 June, 1971 on promotion. My stay in Kuantan was an unforgettable experience which shall never forget. THREE HANDS OF THE CAUSE OF GOD. My first trip to Cambodia was in 1993 and my second trip in April 1994. During our 3 months of our travel teaching in Cambodia, we were notified by our working committee members to concentrate on forming 12 Local Spiritual Assemblies throughout the country before we officially formed the National Spiritual Assembly of Cambodia. There were altogether 21 travel teachers and pioneers from all over the country and we all broke into teams and moved out to various places in the country. We were told to have a meaningful conversation about the Faith with newly acquainted. We were also able to recognize several Bahá’i s who accepted the faith at the Cambodia border during the civil war. When peace was restored they were all back to their native land. By the will of God, all the 12 Local Assemblies were formed, and the good news was notified to the Universal House of Justice. The Supreme Body granted the permission to form the first National Spiritual Assembly of Cambodia during the Ridvan month itself. To witness the first National Spiritual Assembly election of Cambodia beloved Hand of Cause of God Amatu’l-Bahá Rúhíyyih Khánum and Counselor Dr. Loh Lee Lee were present. The members of National Spiritual Assembly of Malaysia officiated the election of the National Spiritual Assembly of Cambodia in Ridvan 1994. After the successful election of the National Spiritual Assembly, Hand of Cause of God Amatu’l-Bahá Rúhíyyih Khánum and Counselor Dr. Loh Lee Lee were invited to witness a Bahá’í marriage of Mr. Jenny from Philippines and Ms. Yai (Auxiliary Board Member) from Thailand which took place in Phnom Penh Bahá’i Centre. As a traveling teacher my greatest joy was when I was standing beside our beloved Hand of Cause of God, Amatu’l-Bahá Rúhíyyih Khánum. With just one look at me she asked if I were a Malaysian Bahá’i. I replied yes, and she immediately held my hand and asked me to sit next to her. This was a very moving moment for me as I never expect that. She praised the Malaysian Bahá’í s for their sacrifices and good efforts in the teaching field. At that time, I felt so proud to be a Bahá’í coming from the Malaysian Bahá’í community. I never realized the Bahá’í of Malaysia had earned the appreciation of the Hands of the Cause of God. In 1986 the dedication of the first House of Worship in Ne Delhi took place. Hand of Cause of God, Mr. William Sears stopped over in Singapore before his onward journey to New Delhi. More than 300 people gathered at the Singapore International Hotel to listen to his talk. While he was giving his speech he saw everyone taking photographs of him. He stopped his speech and said he was much surprised to see everyone snapping photos and request to send the pictures to his home address. He quickly wrote his home address and clips it in the rostrum. I took this great opportunity to develop 4 reels of the photographs taken with him, and decided to hand over to him personally when I saw him next. I was at the temple dedication program in New Delhi. Hands of the Cause Amatu’l-Bahá Rúhíyyih Khánum, Collis Featherstone and William Sears were there. On the third day of the dedication of the Bahá’í House of Worship in New Delhi, I managed to meet William Sears and hand over the albums. He was so happy that he hugged me and my wife and asked us to join him for breakfast in the hotel at 7.00am the next day. He told me that I can invite 6 of my friends. The next day morning, I took along my wife, Mr. Satanam, Mr & Mrs. Krishnamurthy of Cheras in Kuala Lumpur, Mr. G.K. Balan from Kuantan and his daughter, and Mr. Ramasamy of Sungei Buloh. 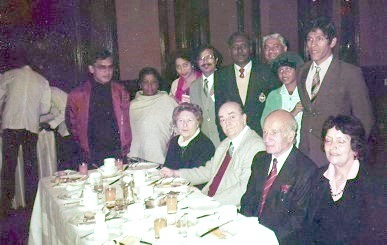 We all had breakfast with Hand of the Cause Mr. William Sears, his wife and many other bahá’i s from the United States. Beside that, we also had a great bounty of meeting the Hand of Cause of God Mr. Collis Featherstone. On the request of the Hands of the Cause, Mr. Satanam and Mr. Krishnamurthy gave a brief talk on the growth of the Faith in our country and the progress of the Asli community. I still believe to this day that this was a great blessing from Bahá’u’lláh for this very simple and unworthy servant of Bahá’u’lláh. One more of my fondest memories is my travel teaching to Sri Lanka In Sri Lanka. My first trip was from December, 1991 to March 1992. My second trip was in July 1999. There I was traveling to many places, especially in the uphill countryside such as Honsee Bazaar, Adams Pak Division, Tekken Estate, Dequa, Honsee Estate, Theresa Estate, Jaffna, and Badulla. There were trains, buses and taxi services available in these areas. Yet there were times one had to walk a long way to reach the destination. I used to conduct deepening classes in the homes where I was staying. We use to start with chanting prayers loud. Most of the time, without we realizing, the people in the village would come and quietly sit around and pray with us. It was always a surprise to open our eyes after prayers to see a large number of people surrounding us. We usually took this opportunity to share the Faith to those villagers. We used the Hidden Words of Bahá’u’lláh as our teaching tool. Most nights ended not only with deepening sessions, but also singing and entertaining ourselves. During the day time, we use to carry out home -visits with the assistance of some local Bahá’í friends. On another occasion, I had the opportunity to serve with 17 youths from all parts of the country. They gathered at the Bahá’í Training Institute in Kodu Kanawa in Kandy. They practiced happy zippopo program under the banner of Institute of Positive behavior. The main idea was to travel to numerous villages to conduct the happy zippopo program, and introducing the Bahá’í Faith through slide shows using projectors. Through this program, several people had accepted the Faith. When I became a Bahá’í I was actively teaching the Faith. Some accepted while others did not accept the Faith. I was sad when people did not accept the Faith. When I told this to Satanam, he told me teaching the Faith is like sowing the seeds. Some seeds would germinate immediately while others would take time. He assured me that all seeds are destined to germinate one day. He even showed me some writings to that effect. I saw this happening in Sri Lanka. 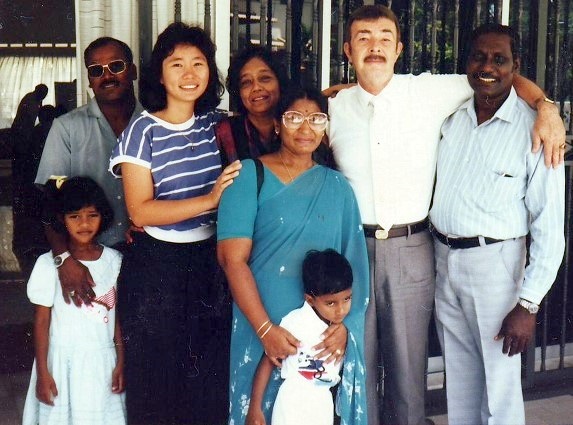 The first time I went to Sri Lanka, I traveled many places to teach the Faith. On one occasion , when my friend Mr. Sankaran and I were in the uphill country mainly known as Honsee Estate, we decided to meet his friends and teach the faith . It was already a little late and dark and we had to walk along the uneven single pathway road almost half kilometers away carrying an oil lamp with 2 young boys who followed us. Somehow we reach the destination and met the family. After a short rest, we taught the Faith to them. Finally I asked the head of the family on his opinion on the Faith. His response was good, but declined to accept the faith. He told me that he would be a Bahá’í when I visited his family again in my next trip. After 8 years later when I had another opportunity to go to Sri Lanka, I made a point to visit them. To my surprise he remembered me and his word. He told that he was ready to be a Bahá’í . Through him, the whole family of six of them accepted the Faith. I retired from Army Service on 11 December, 1981. Then onwards working as Chief Security Officer for 15 years in Kuantan. I then moved to Kuala Lumpur and worked at the National Spiritual Assembly office, and in 2008 I retired permanently. I made as short trip to Brunei from 21 October to 30 October, 2006 to conduct study circle for the newly enrolled Bahá’ís from India. Although I am old today, my spirit and excitement as a Bahá’í still remains within me. I am today aligned with the current plan of the Universal House of Justice. From experience I have seen that the best protection comes through aligning oneself with the teachings of Bahá’u’lláh, and complete obedience with the Bahá’í institutions.